Originally published by Brazilian Women Against Fascism UK Facebook page. The presidential elections in Brazil ended with the victory of the neo-fascist candidate of the far-right Jair Bolsonaro, with just over 55% of the valid votes. After a necessary period of recovery and reflection, we as the Brazilian Women Against Fascism UK group would like to outline what we believe are the next stages of resistance and forms of mobilization that will need to be articulated before the government begins in 2019, but whose weight we already felt in that transition period. We would like to thank everyone who joined us on October 28 in front of the embassy. Our demonstration was very moving and filled us with strength and affection. The solidarity of all those present, the work done collectively, the Brazilian sweets, the music, the drums, the dances, the hugs, the hail rain and the occupation of the streets … Our immense gratitude to all those involved! Our victory is knowing that we are fighting on the right side of history. Despite the electoral defeat, the campaign against fascism gained a lot of momentum in the last week of the campaign, especially among women. Even though the elected candidate had the broad support of companies and the financial market, as well as much of the mainstream media, the repercussion of the #EleNao (#NotHim) campaign showed that the path of resistance is possible, and will become a reality. Since then, we have received many messages of support and solidarity from other activist movements, unions and academic groups, offering support and solidarity, and invitations to participate in activities and demonstrations to debate and protest against the advances of fascism in Brazil and in the world. We understand the rise of the far-right as a global corporate phenomenon, based on privileges for the few and the suppression of the rights of the people. Because of this, we believe in the importance of forming a global opposition. Our movement is a part of and helps build the wider front of resistance of all who oppose Bolsonaro. We are a non-partisan group of women with diverse ideological leanings, but we all have something in common: the strength and the will to fight against the growth of fascism in Brazil. We will not be answerable to the politics of any party, personality or leadership, and we will point out the limitations and responsibilities of each of these. Our main objective is to add and contribute to the resistance, especially of women, in Brazil and internationally. We are very sorry that Brazilians living in London have also mostly chosen to elect Bolsonaro. It will be necessary to confront this, as we cannot allow his hate speech to be normalized. After the first round of the presidential elections, we saw a wave of violence and attacks on women, blacks, indigenous peoples, the LGBTQ + community, teachers and people in general demonstrating against the elected candidate. Such a wave did not cease, nor has it diminished with his election. On the contrary, it has increased. Teachers and students were exposed and threatened in various university settings within Brazil, Quilombola communities and Social Movements are being attacked, as well as the entire LGBTQ+ community, among many other attacks. The dangers that Bolsonaro presents are not limited to minorities and human rights, but they cover a wide range of issues, including the environmental issue and the old colonial social structures. His policy proposals are aimed at keeping the lower social classes ever lower, so that upper classes maintain their exorbitant profits and absurd privileges, dramatically increasing the giant social abyss in which Brazil has been for so long, with direct attacks on those who oppose and denounce the government. We understand that it is the task of all social movements in Brazil to form a united front of resistance against the Bolsonaro government. For this to happen, the connection with the international press and social movements is of crucial importance, to denounce the government and to exert pressure against the path of authoritarianism. This is the role that the collective Brazilian Women Against Fascism UK will seek to play. We have a long and arduous road ahead of us and we will need the help of all who are willing and able to build a grassroots base to disseminate information and a support for our fellow Brazilians. We are always open to the arrival of new comrades. Please get in touch if you want to get more involved and/or have some idea or talent to offer – we need reinforcements! We plan to schedule an open meeting in the second half of December. We count on the support and the help of each one of you and you can also count on us. No one will stop our fight for equal rights for all. We will not be silenced. We are the resistance. 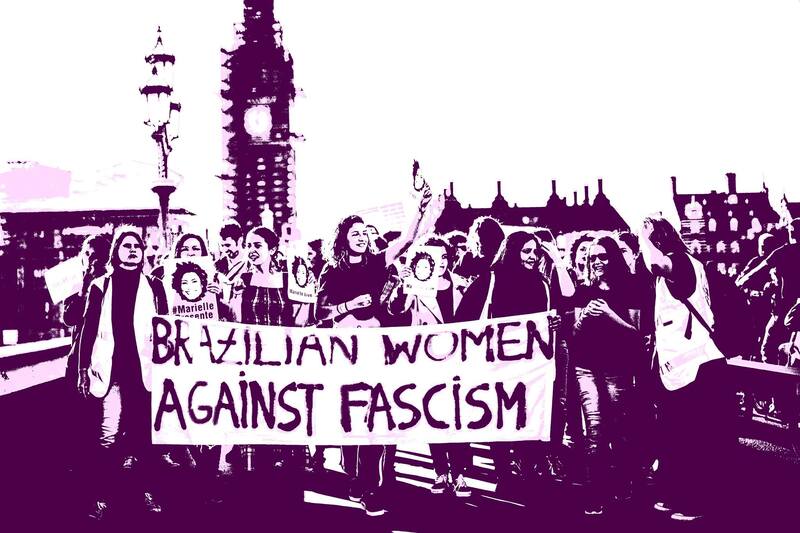 Brazilian Women Against Fascism UK, November 20, 2018.